The end of the school year is almost here! And let's face it - this time of year can be HARD. The sun is shining, the birds are singing, and the kids are ready for a BREAK. It can be challenging for them to focus with the beautiful weather calling their names, and I'm sure that you can use all the help you can get. 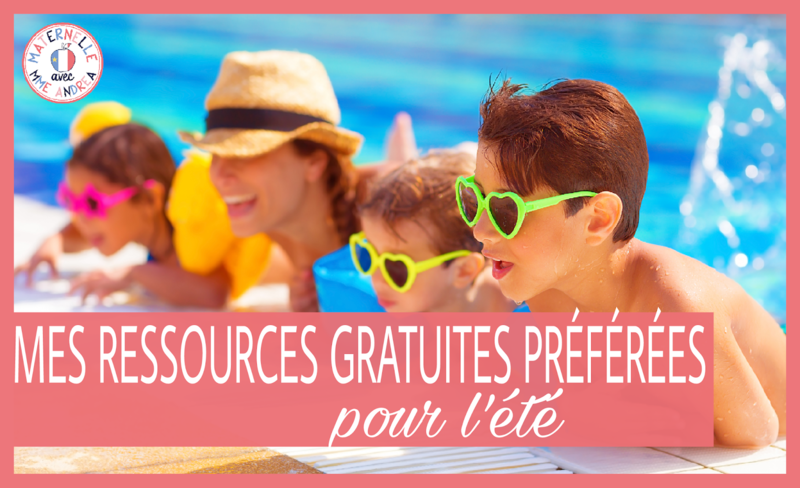 There is absolutely no shame in gathering up all of the fun and free summer-themed resources en français that you can find to help keep your students happy and engaged while you hang on and enjoy the ride! 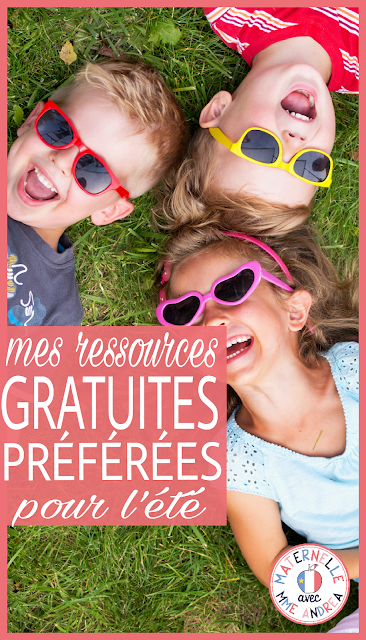 Here are five of my favourite FREE resources in French that are perfect for this time of year! 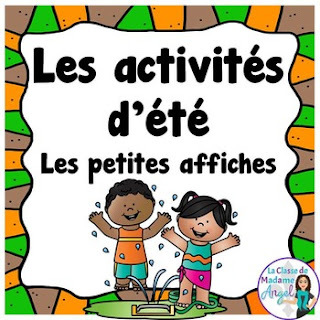 I have posted about this game before, but in case you missed it, it is a freebie both in my TPT store and in my Free French Resource Library. It offers your students one last chance to practice their letter recognition before vacation. And, it's engaging and fun - no one wants to roll an EEK! and get eaten by the shark! Grab in here in my TPT store, or you can find it in the Seasonal/holiday section of my Free Resource Library. 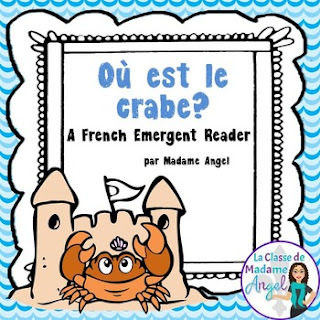 This adorable resource is from Madame Angel. It's interactive and super cute! Your students will read each page and glue a crab in the right place. 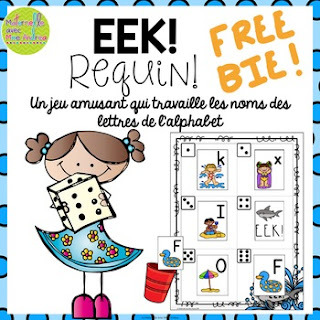 Perfect for the end of maternelle - and your students can use it to practice reading throughout the summer! This freebie is also from Madame Angel. There are 16 mini posters that depict summer activities for you to display in your classroom, use for games, charades, and more! 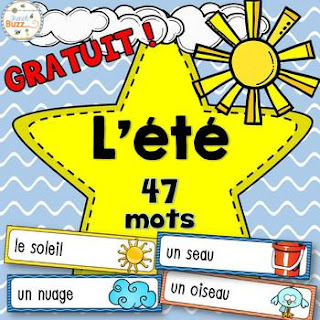 Speaking of vocabulary, French Buzz has a free pack of 46 summer-themed words in her TPT store. The long format is perfect for punching a hole in the top corner of each, putting them on a binder ring, and adding them to your writing centre. This freebie is for you! I made these postcards that are perfect for sending home with your students at the end of the year. 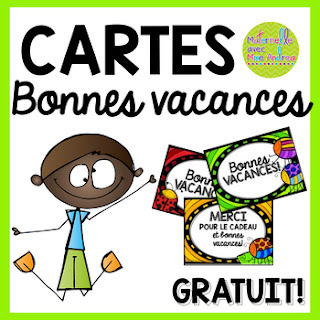 There is a version to say thank you for a gift as well as bonnes vacances, and a version with just bonnes vacances. To save on ink, I like to print these two slides per page to make them smaller! You can find this freebie in my TPT store or in the Free Resource Library as well. Let me know in the comments if you have come across any other great summer-themed freebies en français! PS - Are you a member of my FREE French Resource Library yet?? If not, just enter your name & email below and hit the button. I'll send you the exclusive password and instructions for getting your hands on every freebie I have ever made - and will ever make!